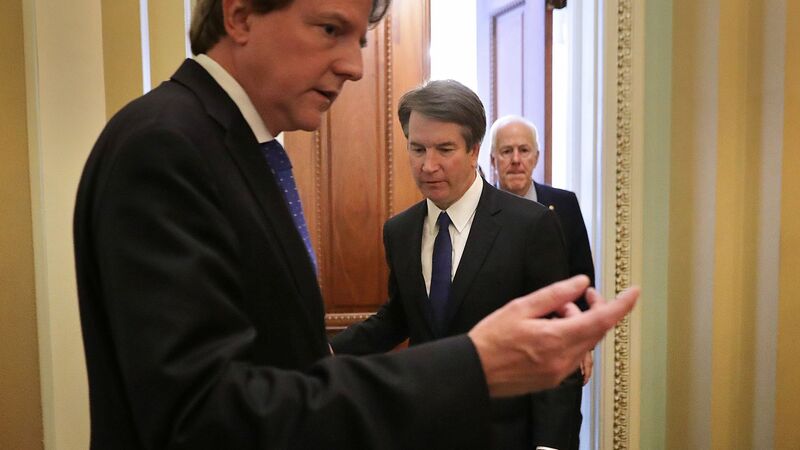 White House counsel Donald McGahn on Tuesday met privately with top Senate Republicans over the scope of how much of Supreme Court nominee Brett Kavanaugh’s long record should be publicly released, reports the Washington Post. Why it matters: The meeting comes on the heels of a substantial release of Kavanaugh’s records from his service in both the judicial and executive branches, which has been a major source of tension in the process of getting to a confirmation hearing. Democrats and liberal-leaning groups are aggressively demanding for the release of thousands of records dating back to Kavanaugh’s time in the George W. Bush administration to ensure he is properly vetted. Kavanaugh submitted a 110 page questionnaire with another 6,000 supplement pages to the Senate Judiciary Committee on Friday, containing biographical information, speeches, writings and past court filings. None of the documents reportedly contain direct information of his service in the Bush 43 White House or his time aiding former independent counsel Kenneth Starr. The details: Senate Majority Whip John Cornyn (R-Tex. ), a member of the Senate Judiciary Committee, declined to say how many the counsel recommended. But he told the the Post McGahn described what a "reasonable, relevant document production would look like," and Cornyn questioned why Democrats need paperwork from Kavanaugh’s service as Bush's staff secretary. He and other Republicans argue that Democrats are stalling the confirmation process. "The one that just seems to be a bridge too far that the Democrats never requested before his 2006 confirmation to the D.C. circuit are the staff secretary documents, which aren’t really his documents," he told the Post. The other side: Key Democrats are refusing to meet one-on-one with the nominee, as is customary after a nominee is named, until both sides reach a deal on the scope of documents that should be released. But Senator Joe Manchin (D-WV) will reportedly meet with Kavanaugh next week.